The Riu Hotel at Punta Cana in the Dominican Republic belongs to the Resort on the long tropical beach next to the warm water of the Caribbean Sea. All rooms of Riu Naiboa have a Air-condition, TV, balcony or terrace and a own hot water bathroom. To the perfect white beach it´s about 250 meters through the shopping street of the high class Resort. The small booking office offer daytrips around Punta Cana and the whole country. The friendly and multilingual service will help you to find a Scuba Diving Course and other activities. Riu All Inclusive is not just a slogan; here you get food, cocktails, beverages and many other thinks like snorkel gear or the fill up service for your mini bar without extra payment. The buffet has all kind of local and international food. The Cocktails on the pool bar are the right choice for a nice holiday here at the DomRep on the Caribbean Sea in America. The prices are more expansive than at a Guest House for travelers but for that you get a four star service. 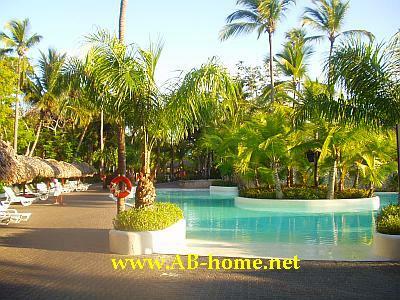 The Riu Naiboa Resort is a good choice for tourists who like comfort and luxury at holidays. Many people from around the World come here for vacations and honeymoon to enjoy the good service of this nice Hotel and the tropical weather on the beach of Punta Cana in the Dominican Republic. I can recommend this hotel, it offer a friendly service and good food for all who like just to relax on their holidays. Thanks for the great post. I always try to bookmark travel or vacation related posts like this one. Love the modern appear. I enjoyed the content. Thanks for the excellent writing of hotel reviews and accommodation reports.